The Future of Campus Dining: Are You Prepared for the Next Generation of Students? While your campus may run the best dining programs for the students enrolled today, are you fully prepared for the next generation of students? The next wave of college students will have their own unique dining needs, preferences and behaviors. That’s one of the lessons learned from our Student ViewPOINT survey, Aramark’s proprietary survey platform that receives feedback from more than 100,000 middle and high school students annually. Knowing how students’ dining preferences change year-to-year can have a significant impact on the success of college and university foodservice programs in many ways, including students’ propensity to enroll and re-enroll in schools’ dining programs. The ViewPOINT survey shed light on what middle and high school students would prefer to eat for breakfast and lunch. It’s likely these preferences will carry over to their college years, too. 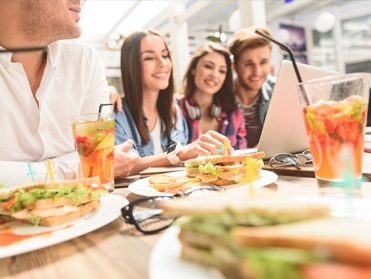 This insight, gleaned from more than 100,000 students, provides higher education institutions with valuable lessons on planning breakfast and lunch services, which they can use to make informed decisions on the future of their dining programs. The ViewPoint survey found that only 20 percent of middle and high school students eat breakfast at school, while 42 percent eat breakfast at home. However, students said they would eat breakfast at school more often if they were offered foods they like. Some of students’ top morning menu preferences include breakfast meats (like bacon and sausage), toaster pastries, waffles, French toast and yogurt. What’s more, the study revealed that students want to have options on where they get and eat their breakfast. Nearly 74 percent of students would like to eat breakfast in the classroom and 73 percent would love the convenience of getting food from a grab-and-go cart. Meanwhile, only 14 percent prefer to eat breakfast in the cafeteria. These options could likely influence more higher education students to purchase breakfast on-campus, as well as give busy college students the convenience to grab breakfast foods they’ll enjoy on the way to an early class or between morning classes. Most middle and high school students would eat lunch at school five days a week if they were more satisfied with the menu options, according to the ViewPOINT study. Currently, they are only buying school lunches an average of 2.8 times a week. The top reasons they don’t eat lunch at school? Although some if not most of these may be due to the recently introduced Healthy Hunger-Free Kids Act, which eliminates all white bread and has other constraints making it more difficult to offer student favorites, it does highlight the importance of tasty yet healthy offerings and convenience. When asked about their food service-style preferences, we discovered most students would like lunch served food-court style with separate food stations. Many students also indicated they would prefer made-to-order dining options, as well as grab-and-go options. Aramark has observed year after year the rise in desire for these grab-n-go style options. Further, middle and high school students are interested in trying new types of food. And 55 percent say they are interested in making healthier food choices. Important options for them include freshly prepared food, fresh fruit and vegetables and locally grown produce. Another development impacting K-12 students’ dining habits that could influence the food choices of incoming college students, as well, is the USDA’s Hunger-Free Kids Act. The program dictates menu-planning requirements in federally funded K-12 district schools, including providing breakfast, healthier food options and more fruit and vegetables. An example of the long-term influence of the program on children includes making breakfast available at school. This requirement has the potential to condition departing high school seniors to more readily dine in the morning in their college campus cafeterias. Further, because the USDA program includes adding more fresh produce in students’ diets, this has the potential to make students more accustomed to these food options and even prefer them. As a result, students are likely to want fresh fruit and vegetables when they graduate from high school to higher education. Colleges and universities can easily meet the dining expectations set by the USDA program by adding more healthy food options, including fresh and locally grown produce, to their menus. Aramark applies vital insights from both the annual Student ViewPoint survey (K-12) and the DiningStyles survey (colleges and universities) , along with years of experience managing food programs at thousands of schools, to continually innovate food and nutrition programs at K-12 and higher education schools. Our experience and research allow Aramark’s foodservice professionals to develop effective customized solutions and practice continuous improvement to positively impact the dining programs at the schools Aramark serves. Ready to get a head start on the dining trends of the future? Check out our free guide, Best Practices to Boost Campus Meal Plan Sales.